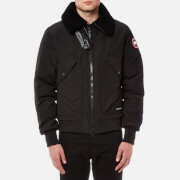 Men’s leather jacket from Italian-Canadian fashion label, Dsquared2. 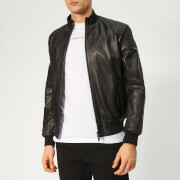 Presented in soft, supple sheepskin leather, the black biker jacket features a wraparound collar, a front zip fastening and ribbed trims at the collar, cuffs and hem. Multiple pockets to the interior and exterior are secured with a mix of zip fastenings and press buttons. Branded zip pulls add the finishing touch to the design. Lined. Main: 100% Sheepskin Leather. Lining: 100% Cotton.